Cinco de Mayo is an official holiday in Mexico, celebrating General Ignacio Zaragoza’s surprising victory over the French at the Battle of Puebla 155 years ago. It’s become somewhat of an unofficial holiday in the United States, where Americans of Mexican descent and almost anyone besides Donald Trump can embrace Mexican culture, or whatever we pass off as such. And since it’s the first Cinco de Mayo since America’s famously anti-immigration president has taken office, Friday promises to have a bit more fervor than usual. But to Oscar De La Hoya, the Mexican-American boxing legend-turned promoter, it’s the celebration on Saturday, Seis de Mayo, to which Trump should really be paying attention. 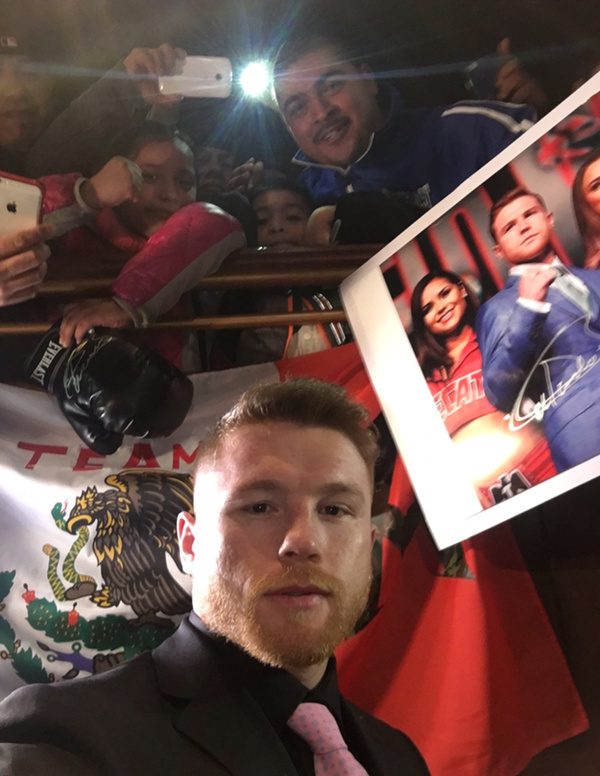 That’s when a sold out crowd at Las Vegas’s T-Mobile Arena will watch the catchweight clash between Guadalajara native and WBO world super welterweight champion Saul “Canelo” Alvarez and Julio Cesar Chavez Jr., the often-criticized namesake of Mexico’s most legendary athlete in the country’s most beloved sport. It’s not just that De La Hoya believes Saturday’s “is this the biggest fight in the history of Mexico.” The founder of Golden Boy Promotions is talking about the economic impact of a show that sold out in eight days, has drawn thousands of tourists to Las Vegas, and will earn many millions of dollars in pay-per-view fees, international television rights, and a closed-circuit deal with Fathom Cinemas for live showings in movie theaters throughout the U.S. In fact, Mexico’s two largest networks, Televisa and TV Azteca, are carrying the same main event for the first time in history. 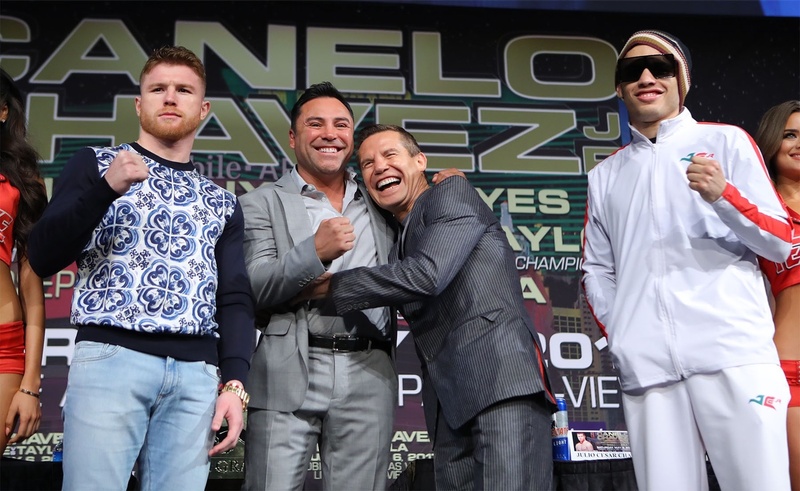 “That’s how important this fight is,” De La Hoya told Fightland. And in case the point wasn’t made finely enough, one commercial for Canelo-Chavez Jr. depicts both fighters running through and obliterating Trump’s proposed border wall on their way to the Las Vegas Strip. “I strongly feel that the fact that you have two of the most popular Mexican fighters breaking through the wall and meeting in Las Vegas—it is an indirect hit to Donald Trump,” De La Hoya said. “A lot of people feel proud that two Mexican nationals can come to Las Vegas, the U.S. of A., and have such an economic impact in our society. It’s unheard of. But even without the political angle, Saturday’s fight would not have any problem capturing a massive audience. 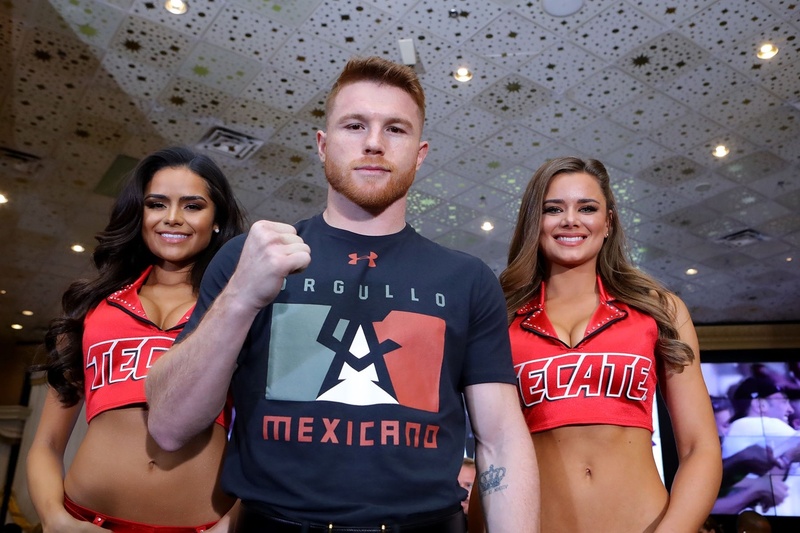 Brooklyn resident and diehard Mexican boxing fan Victor Lopez poses with his children behind Saul “Canelo” Alvarez after a press conference at Manhattan’s Hard Rock Cafe. For many, Chavez Jr.’s 2015 loss to Poland’s Andrzej Fonfara typified a career that has suffered for his lack of discipline. He’s struggled to make weight on occasion (should he weigh more than 164.5 pounds at Friday’s weigh-in, he’d be penalized $1 million), and Chavez Jr. (50-2-1, 32 KOs) was once suspended nine months and fined $900K by the Nevada State Athletic Commission after testing positive for marijuana. De La Hoya, Canelo’s promoter, agrees with that assessment somewhat. But now that Chavez Jr. is 31, De La Hoya explained, he’s becoming more professional. Hiring Ignacio Beristáin, who once trained De Lay Hoya, is a step in the right direction. But the biggest change has been physical. And it’s not like Chavez has been unimpressive. Over his last eight fights, he’s landed 41 percent of his punches compared to just 26.7 percent for his opponents—that’s a +14.3 percent differential, which ranks fifth among all boxers according to CompuBox. Canelo, meanwhile, connected on 35 percent of his shots over his last eight fights while limiting opponents to 24.5 percent (+10.3, 13th overall). In fact, De La Hoya thinks Chavez Jr. might be somewhat underrated, given the intense scrutiny that comes with being the son of a legend. “I would hate to be in Julio Cesar Chavez Jr.’s shoes right now at this moment because the pressure that he must be feeling is like no other,” De Lay Hoya added. But Canelo is facing his own pressure. Following his easy knockouts of Liam Smith and Amir Khan, both of whom weighed in under 155 pounds, Mexican boxing fans have grown impatient for a matchup with unified middleweight champion Gennady Golovkin. De La Hoya currently has a hold date in September for a fight between the two—a bout that would solidify 2017 as the best year in boxing’s recent history—but first, Canelo has to win, and that prospect is complicated considerably by Chavez Jr.’s 6-foot-1 frame. Obviously, as Mexico’s biggest boxing star, Canelo is expected to take risks as he did in 2013, when, at 23, he lost a majority decision to the legendary Floyd Mayweather Jr.
Now that the 26-year-old phenom is eyeing a potential matchup with the larger Golovkin, facing a true super middleweight who has fought as high as light heavyweight seems appropriately difficult. 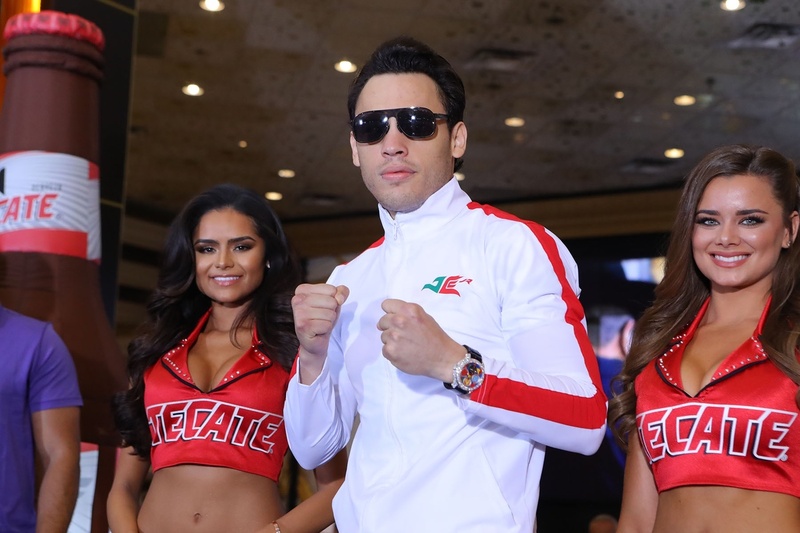 Canelo may have the power of a light heavyweight or even cruiserweight, but he’s only 5-foot-9, and by the time the two step into the ring, Chavez Jr. could have a considerable weight advantage. And as much as De La Hoya would like to start booking a lucrative showdown with Triple-G, Saturday is anything but a sure thing for his fighter. And if fight fans are still looking for a reason to fork over $59.99 for HBO PPV’s standard definition ($69.99 hi-def), De La Hoya doesn’t hesitate to point to the great Mexican rivalries like the four Rafael Marquez-Israel Vazquez epics and the Erik Morales-Marco Antonio Barrera trilogy. It might be a generalization, but it certainly isn’t a negative one.